Most of his colleagues considered the idea insane, and investors apparently agreed, so Lett and his wife, Diana, shelved dreams of a state-of-the-art winery and set up instead in an old turkey processing plant in McMinnville. His vindication came in 1979, when Franceâ€™s prestigious Gault Millaut guide staged an â€œOlympics of the Wines of the World,â€ a blind tasting pitting Burgundyâ€™s best against a host of foreign rivals. Lettâ€™s 1975 South Block Reserve came in third. The following year, there was a rematch at the behest of Robert Drouhin, head of the eminent Burgundian nÃ©gotiant Domaine Joseph Drouhin, who believed the results to have been a mistake and who offered his own best wines for the challenge. This time the Eyrie took second place, two-tenths of a point behind Drouhinâ€™s stellar 1959 Chambolle-Musigny. The international press trumpeted the results. 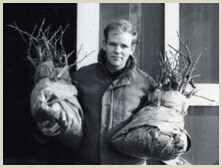 As the industry he ignited grew, and as unusually warm vintages led to the ascendence of a fruit-forward, maximally-extracted, early-drinking style of Pinot Noir, Lett held to certain ideals: 90 percent of winemaking happens in the vineyard, and once the grapes reach the winery, they should be treated with a minimum of manipulation and oak. Few winemakers disavow that credo, but Lett actually practiced it, risking the scorn of critics who typically favor what he acerbically dismissed as “immediate gratification wine” that’s “already over the hill on the vine.” Time after time, time proved him right, as his wines began to express their finest nuances long after most of their contemporaries had lost all appeal. And that’s why, though I talked with him many times—served him when I worked as a waiter and interviewed him as a wine writer—I got to know him best through his wine, one bottle in particular. I had been helping a friend clear out her cellar when we found a 1984 Eyrie Pinot Meunier with the distinctive hand-drawn labels he used for some of his lesser bottlings. “It’s probably nothing,” she said, giving it to me, and I figured she was right: the varietal is an obscure Pinot Noir mutation best known as a blending grape, and more to the point, the vintage was disastrous, with a legendarily cold and rainy harvest requiring heroic effort to salvage whatever fruit had ripened. Hours later I opened it; my God it was glorious. 21 years after that hellish harvest, it was soft and supple, with autumnal aromas of forest floor, reminders of red fruit and the distinctive taste of the place where Lett came to plant vines and readjust the universe 43 years ago. With his family at his side, David Lett died as growers and vintners across the Willamette Valley carried out the hard work and celebration of this year’s crush, dispatching the harvest into the fermenters where it begins its second life, a ritual virtually unknown here before he arrived. There are hundreds of wineries in the valley now, thousands of acres planted, hundreds of millions of dollars generated, but the better part of his legacy is that, with conviction and integrity, he substantially increased the amount of beauty and pleasure in this part of the world. He was an inspiration to countless people, including Les Garagistes. Requiescat in pace.